But a century has taken its toll on the grand murals; dirt, grime, and environmental factors have weakened the paint and the canvas. Treating the murals is urgent, but the conservation team and VHS staff both agreed that researching the murals and Hoffbauer’s process would be an essential part of the project. In February VHS volunteer Lee Ball and I went to the Archives of American Art in Washington, D.C., to investigate a collection of Hoffbauer’s papers. Items in the VHS archives had answered many questions about Hoffbauer’s time in Richmond, and Cleo Mullins, lead conservator on the project, was hopeful that the Archives in Washington would offer even more insight. I will hand our research trip narrative over to my travel companion Lee Ball. 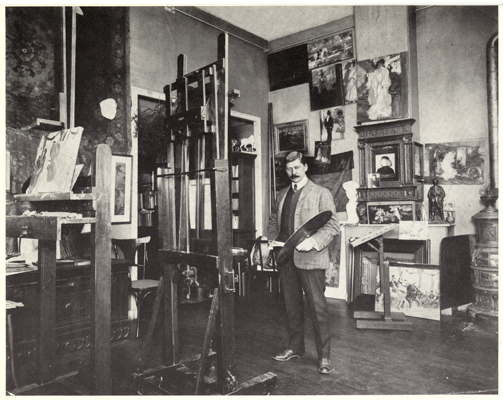 One of our objectives in reviewing records at the Archives was to find information that might assist Cleo, who was interested in areas such as the materials Hoffbauer used, painting techniques, and changes made to the murals. Elaine found a 1952 letter from a Richmond artist to Hoffbauer asking about the mural painting materials. There was no response in the Archives files, but later we located the response letter in the VHS files and passed it along to Cleo (Mss2 H6753b). 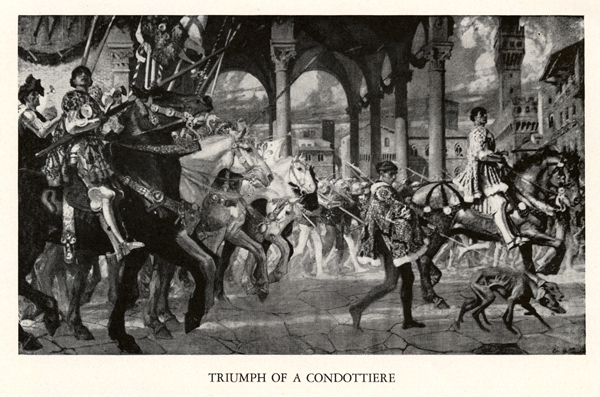 “Triumph of the Condottiere” This painting won Hoffbauer the commission for the murals in Richmond. 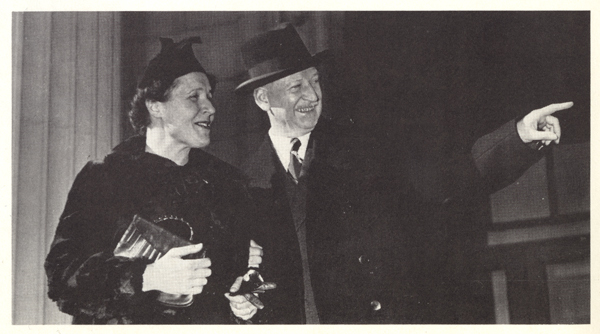 While a soldier during World War I (completion of the murals was interrupted when he returned to France to fight for his native country), Hoffbauer received several letters from J. Taylor Ellyson, the CMA president (and Lieutenant Governor of Virginia) and Mrs. Ellyson. 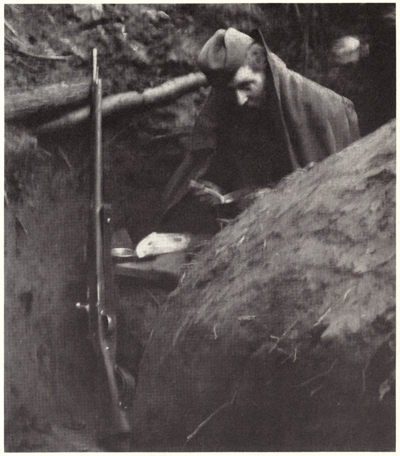 Mr. Ellyson often inquired about the war and in one letter wrote that his grandson “says don’t forget to bring him some relics.” Mrs. Ellyson wrote about conditions in wartime Richmond (“we have wheatless days and meatless days”). When Hoffbauer was preparing to return to repair some damage to the murals, Dr. Douglas Southall Freeman, longtime editor of the Richmond News Leader and an Association trustee, wrote,“(Y)ou must not think of going to the hotel. . . take a taxicab directly to our house.” And a friend of Hoffbauer’s asked for a $500 loan “when your big check comes in.” The “big check” (we think this is the mural payment) must have come in. Hoffbauer made the loan and was repaid three months later! This visit to the Archives may not have answered many of Cleo’s questions, but it helped Elaine and me get to know the man behind the murals. I completely agree with Lee. This trip has enabled us to tell a more complete story of Hoffbauer and his experience in Richmond while creating our Memorial Military Murals. The Mural project is more than halfway complete! The conservation team is focusing on the large Autumn and Winter murals and their smaller, flanking panels. There is still plenty of time to visit the VHS and see the incredible work being done to bring these murals back to life. You can also keep up with the murals’ progress at http://www.vahistorical.org/hoffbauer/. Elaine Hagy is the Senior Grants Officer for the Virginia Historical Society. Lee Ball volunteers for the Advancement Division. They are on a mission to educate Virginians about Charles Hoffbauer.